It's the gold trim that really sells it. Nokia is reportedly looking to sell Vertu, their luxury phone brand, for the third time since December, according to published reports. The Finnish phone manufacturer is in talks with private equity group EQT, the reports claim, to sell the Vertu brand for $249 million (£160.53 million). 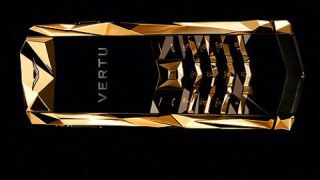 Vertu is Nokia's line of insanely expensive phones for the super-rich elite, who don't mind spending hundreds of thousands of dollars on a single device. Or maybe they do, as reports over the last half-year have been claiming the Nokia would like to separate itself from the odd brand. It's no wonder that Nokia, who've continuously lost market share since Apple started dominating with the iPhone, are looking to separate themselves from the Vertu brand. Nokia was even downgraded to "junk" status by Standards & Poor in April. Vertu phones can cost hundreds of thousands of dollars, often featuring such indulgences as crystal screens and keys made of sapphires. Their ringtones have even been specially recorded by the London Philharmonic Orchestra. And the phones aren't particularly advanced or powerful, though they're apparently quite popular among wealthy elites in the Middle East. Nokia was previously in talks to sell Vertu to private equity group Permira, who were also prepared to drop $249 million (£160.53 million) on the brand. Before that, reports claimed that Vertu would go to one of several unnamed private equity groups for $300 million (£193.41 million). But those deals fell through for unknown reasons. A Nokia spokesperson told TechRadar that the company does not comment on rumors or speculation, but more details will likely be announced soon, as the deal is expected to be completed this week.